Well, the answer is that a while back there was a pilot who put together an Overview Creator that allowed you to setup your overview through a friendly interface and export an XML file you could then import into Eve. Part of this website's functionality was the ability to customize your selection text into very fancy outputs like the one you see above. Alas, that website has gone down (was balss-industries.com) and I've emailed the creator to find out if it can be brought back to life. No word yet. 1) In game, right click on your Overview tab and choose to export overview. This creates an XML file in your "My Documents\Eve\overview" folder (or corresponding folder on your machine). 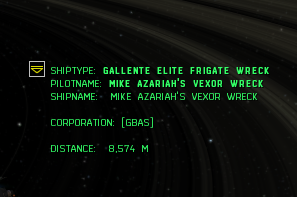 Note that the last one is Distance with a type of "None" because the client automatically puts the distance at the end of the ship labels I believe. In theory you could get creative and have multiple colours, font sizes and effects, or other information important to you. If you decide to try this out, please export your current overview and save it safely somewhere as a backup. Note: as far as I know, this is not considered an exploit by CCP according to the Overview Creator website that advertised on the forums while it was in operation. While we do not currently consider this to be a violation of the EULA, please note that we do reserve the right to change this decision at a point in the future should we find it necessary. If you have any other questions or problems, please let me know. That's mad! I look forward to other people's examples. I... might use this. Always wondered how the RvB people had the red one on theirs. /me is cracking up . . .why am I the example? @anditburnedhteheavens.com, to get those same newlines as in the picture, at least on Crucible (though his recent Duel videos were also done on Crucible), I had to use "<br>" instead of an actual newline in the XML. As XML *shouldn't* care about CRLF or just LF, it shouldn't matter that I was editing this on OS X (tried Dashcode and vim). Hm. Unless CCP steps in and goes "yeah, no, that's an exploit/hacking," I shall bookmark this and experiment with it if/when I get back into EVE. For the record, I would be shocked if they do - all this information is readily available elsewhere in the UI, and while I could see CCP taking the attitude of "we didn't expect people to do that" or "we wondered when you'd catch on to this," handing out banhammers for this would surprise me. I will send in a petition asking explicitly about this to assuage any fears. Can't get it to work, the second I edit anything in Dashcode, Eve sees the file as invalid. Perhaps it can't be done with OS X? @Razzimous, I had the same issue at first with Dashcode. Make sure that you are saving as Text and that you add the .xml at the end. Also make sure you use the raw code (as shown in Kirith's third picture) and not the pretty code (e.g. use "& lt;" (no space) instead of "<"). ( or "& lt;br:" rather) in order to add line breaks? entries in the raw XML. This is awesome. The fact that someone created a means to edit the UI purely for graphical improvements has me mindboggling as to why CCP hasn't made this a feature themselves. Thank you very much for making me aware of this! to get it to make a new line you need to ad "& # 10 ;" (no spaces) at the end of the part name post. forgot to mention the "& lt;" and "& gt;" are "<>" brackets. It must be written this way or else you will get an invalid file error in eve when u try and import. oh and a few more things. you can make each line a different color if you like, the color code is 4 bit hex for ARGB colors. lastly you can add the newline code ( & #10;) into the part name post as outlined in above post, of the labels that don't display any info. This will create a blank space in between each line of information. you can see what i mean by looking at my overview. ytnite could you post your overview .xml here please? what are u using o edit the xml ? and make sure u go through and check there are no typos. I did, how do you upload a .jpg of just the code? I'm also kind of confused why you have two open label at the beginning. ehh delete one, forgot to remove that label while i was messing around earlier. sorry mate, can't really see any errors.